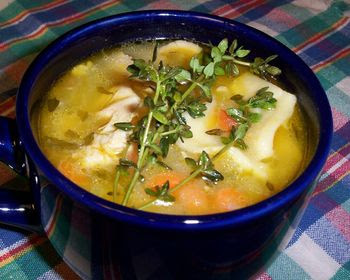 In this recipe of chicken soup, we use just a bit of garlic powder and white vinegar.These spices can be used delicately to enhance many other flavors without being obtrusive. Add parsley, salt and pepper to taste, and top off with some dried or a sprig of basil, and then sprinkle some parmesan cheese once it is in the bowl. Place chicken in a large pot and bring to boil. Continue to boil slowly for 40-60 minutes depending upon how large the chicken is. You will see the meat start to separate from the bone. Pull the meat off, refrigerate and save till later. Strain the broth through a colander to remove stray skin and other non-meat chicken slough, and then return to pan and reheat. If necessary for quantity, add more canned broth or preferably, water and chicken base paste. Both of these have salt so wait on this for awhile. For people that don't taste food well, add more chicken base paste and bump the flavor. It's amazing what this can do. Add about a half tsp of garlic powder and one oz of white vinegar for 6 cups of broth. Toss in your diced onions, celery, and carrots to cook until they are tender. Add pasta and cook till done, return chicken to the pan, and reheat. Chicken is a common ingredient in many recipes because it's high in protein and tastes great. Not all chicken meat is alike. The truth is that certain cuts of chicken meat are much healthier than others. In addition, fried chicken or chicken prepared with lots of oil, sugar or other fatty ingredients pack a lot of calories. Chicken is a great source of protein. One 6 oz. serving of chicken contains 48 g of protein. Chicken is also rich in potassium, calcium and contains no carbohydrates. The nutritional makeup of chicken makes it a healthy, filling food option. By eating healthy cuts of chicken, you'll consume only a small amount of calories and your stomach will stay full for hours. This decreases your likelihood of snacking on unhealthy foods later in the day. Although chicken is a naturally healthy food, it's easy to mistakenly consume unhealthy chicken dishes. The best way to prepare chicken is to simply grill it or bake it. You should avoid deep frying or stir frying chicken, as this imparts a ton of calories and grams of fat. If you'd like to marinate the chicken beforehand, avoid fatty dressings and instead try just a little bit of lemon juice, salt and pepper. If you need to use oil to prevent the chicken from sticking to the pan, it's best to use a light coating of nonstick spray. Chicken is an excellent source of the cancer-protective B vitamin, niacin. Components of DNA require niacin, and a deficiency of niacin (as well as other B-complex vitamins) has been directly linked to genetic (DNA) damage. A four-ounce serving of chicken provides 78% of the daily value for niacin. Chicken is not only an excellent source of niacin, but is also a good source of vitamin B6. This particular mix of B-complex vitamins makes chicken a helpful food in supporting energy metabolism throughout the body, because these B vitamins are involved as cofactors that help enzymes throughout the body guide metabolic reactions. Lyosha 23 Οκτωβρίου 2012 - 2:10 π.μ.